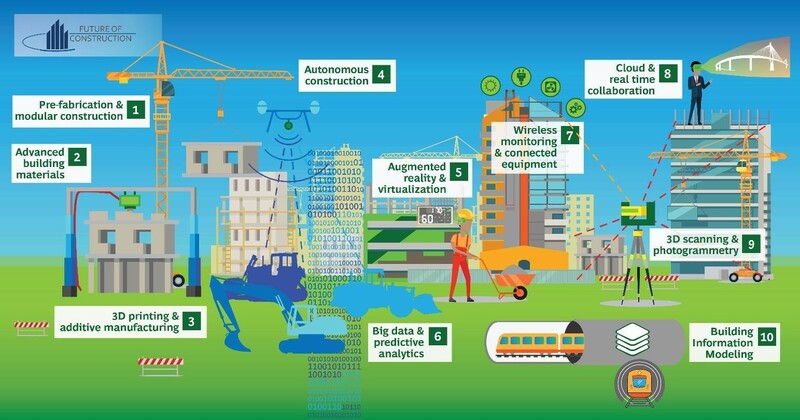 The construction industry has been urged to shed its decades-old working practices and embrace the wave of digitalisation sweeping the global economy if it is to shake free of stagnation and flourish with trillions of dollars of cost savings. The fourth industrial revolution, as it has been termed, has seen a revolutionary merging of the physical and digital realms, according to the World Economic Forum, with endless combinations of information-powered and networked technologies transforming the way industries operate. Now leaders in the built environment sector are being encouraged to adapt their strategies and capitalise on the opportunities offered by the new ways of working to improve productivity and sustainability. 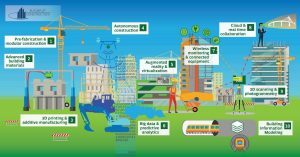 Industry reports indicate that within a decade, full-scale digitalisation could generate cost savings of between $1 trillion to $1.7 trillion with increased integration of technologies such as building information modelling (BIM), prefabrication, wireless sensors, 3D printing, robotics and artificial intelligence (AI). Coupled with issues such as climate change, depletion of natural resources and rapid urbanisation, construction practices need to evolve and move away from reliance on manual labour and heavy metal machinery. We expect our homes and working spaces to be technologically up-to-date, yet fail to demand the crossover into the actual design and build aspects of those very same constructions. That cannot make sense and must change if the industry is to thrive and maximise its potential. “The construction industry’s decision-makers should understand the disruption outlined in the future scenarios as a wake-up call,” said Luis Castilla, champion of the World Economic Forum Future of Construction initiative. The engineering and construction industry employs in the region of 100 million people across the globe who undoubtedly face an uncertain future with the rapid onset of technological solutions. But if their leaders adapt swiftly enough to these changes and view them as positive opportunities, the nature of the work might change but the jobs should remain – just in a healthier, more sustainable environment. Here at Syntegra, we are constantly scanning the technological horizon to identify solutions to improve the carbon footprint of the built environment. We are particularly interested in seeing the expansion of AI in our business processes to improve all round efficiency. It would give us an enormous sense of satisfaction and pride to work with more like-minded organisations at the earliest stages of building design to capture the very best practice networked technology has to offer to develop the most efficient and sustainable structures. It’s not too late but time is running out. The construction industry has lagged behind other areas of the economy for too long now. It’s time to grasp the fourth industrial revolution with both hands and show the watching world just how far it is prepared to go in terms of playing its part in the sustainable future of our planet.